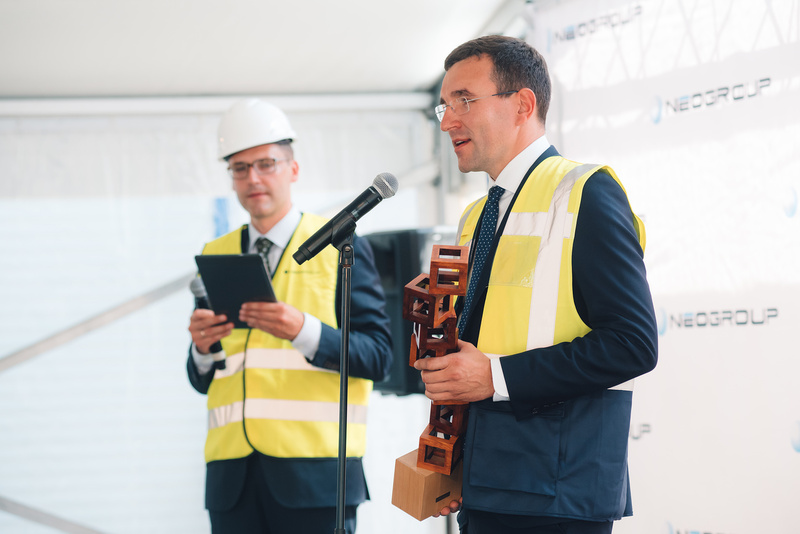 NEO GROUP, producer of polyethylene terephthalate (PET) granules, located in Klaipėda Free Economic Zone (FEZ), launches new production line. With the expansion of production capacity, the company has become the second-largest company of this kind across Europe. It is estimated that €50 M investment will increase production capacity by 50%, while the market supply will grow by 155,000 tonnes of products annually and create 35 new jobs. As one of the major European PET producers NEO GROUP decided to increase its production capacity in response to ever-increasing demand. The additional capacity of the new line is planned to reach 480.000 tons per year, thus further strengthening the company’s position in foreign markets. According to Paulius Ambrazaitis, NEO GROUP Chairman of the Board, increased production capacity will help the company to reinforce its reputation as a reliable international supplier. « Already we are one of the largest suppliers throughout the European market. The new production line will further strengthen our position and we will be ready to meet the ever-growing needs of the EU market. The increased capacity will help us expand the geography of our sales“ he says. The chairman of the board of the company emphasizes the importance of the financial partner Swedbank, the Ministry of Economy of Lithuania, Klaipėda District Administration and « Invest in Lithuania » participation and support during the investment project implementation of the new production line. Implementing € 50 M investment project, the company has created 35 new jobs. It is planned that the company’s revenue will exceed 500 million Euros per year, of which even 400 million Euros will consist of export sales, when the production of the new production line is realized. This will allow NEO GROUP to become one of the most important exporters and taxpayers in the country. According to Ambrazaitis, we expect that the new production line will contribute positively to the Klaipėda economy. “We will not only create more jobs directly and indirectly but we will also pay more taxes, buy more goods and services from other businesses. Increased production will indirectly stimulate job creation. We will transport more goods by road, by rail and by sea, thus increasing cargo business in Klaipėda port. It is estimated that one job in the manufacturing sector creates 4-5 indirect jobs », – says Ambrazaitis. NEO GROUP takes its environmental responsibilities seriously. In the full-scale manufacturing facilities, the two lines for polyols production are integrated and use all the wastes of its own PET production as raw materials. In 2014 a bio-boiler station was brought into operation which helped to decrease an annual carbon dioxide emission by 30 thousand tonnes, and is sustainably investing in energy saving programs enabling it to reduce the electrical energy consumption by 4 million kW and water consumption by 20 thousand cubic meters per year. In the short-term production modernization activities planned for facilitating the processing and reutilization of recyclable materials. As a result of professional team work and the favorable investment climate, NEO GROUP aims for further development in the Republic of Lithuania. NEO GROUP is one of the largest producers of polyethylene terephthalate (PET) granules in Europe, located in the Klaipėda FEZ. With the team of more than 200 professionals, the company is also among the largest companies in the Klaipėda region and one of the top exporters in Lithuania. Vous êtes interessés par nos produits? Contacter NEO GROUP pour en savoir plus sur NEOPET resine et NEOPOLYOL produits et solutions. Envoyez un E mail à [email protected], et nous vous réponderons dans les meilleurs délais.